Anurag Bist from Ashmar IP will be discussing IP Strategies for Start-ups and Entrepreneurs. This discussion will cover specialized research reports that are available, why they might be beneficial to early stage startups, and how they can be used to create an intellectual package that increases the value of your business or concept acquisition. Learning to essemble a compelling package is essential when looking to sell or license your products and concepts. The better the package; the better the deal you'll be able to drive. Come and learn the essentials from an expert, and how you can do it without breaking the bank in the process. Anurag is Founder and CEO of Moxair a technology start up that has developed solutions for low power display technology for Tablets, Smartphones and other mobile devices. 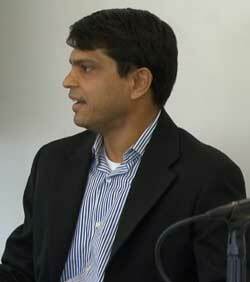 Anurag is also founder of Ashmar, an Intellectual Property Analytics firm. Anurag brings years of entrepreneurial, leadership and IPR domain experience to the founding team of Ashmar. In 1999, Anurag co-founded VxTel, a successful fabless semiconductor company providing silicon solutions for VoIP infrastructure. Anurag led the worldwide firmware team at VxTel and helped grow the company from 5 people to over 160 in 2 years. In 2001, Intel acquired VxTel for $550 Million in cash. Anurag has held various technical and management positions in companies such as Intel, Conexant Systems, Rockwell Semiconductor Systems and AT&T Bell Labs. He holds over 15 US patents and has over 15 other patents pending, and is a past recipient of IEEE Capocelli award for paper in Data Compression Conference. He is a Charter member of TiE Southern California. He is also a member of the Pan-IIT Leadership Council and a recipient of 2008 IIT Kanpur Alumni Award for Entrepreneurial Leadership and Technology Innovation. Anurag received an B. Tech. degree from the Indian Institute of Technology, Kanpur, India, his M.S. degree from Princeton University, and his Ph.D. degree from the University of Hawaii, all in Electrical Engineering.